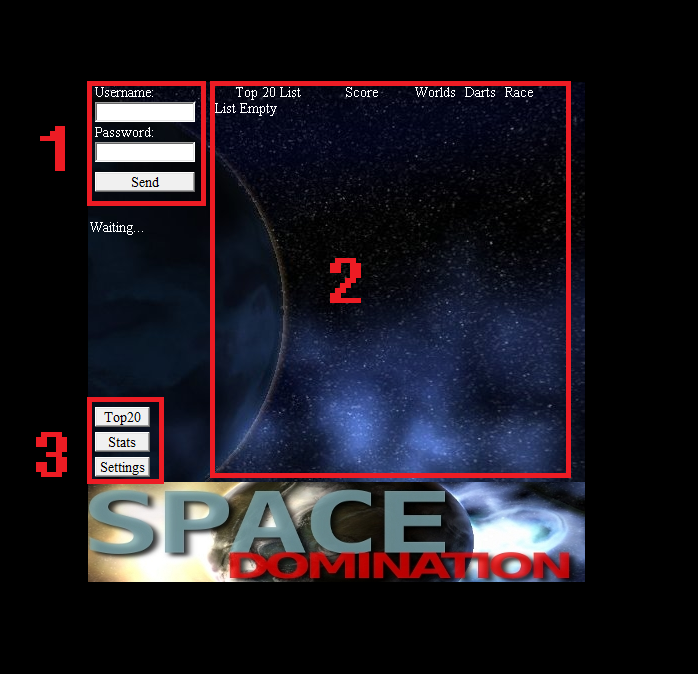 When you first come to the play page, you will come to screen similar to the one shown below. From this screen you can access different information about the game, as well as login. To log in, you can simply type your desired username in, as well as a password (1). The first time that you log in on a given round they can be anything valid, but afterwards the password must match the one that you started with. From this screen you can also see the current Top 20 (2). This is a list of the people with the highest scores, and it also shows their race, how many worlds they own, as well as how many Star Darts they have. The buttons on the bottom allow you to access other information about the game (3). The stats button will tell you about the current galaxy and the settings button will tell you the parameters that the server has been set up with.